With all due respect to those of you who actually care, and in consideration to those of you who are all about it, I present to you, with no further delay the Bi-Annual LORD DOOM's Create Your Own Adventure Building Challenge. Now, come to grips with me for a minute, you may say, "Who is this "DOOM" dude? What the double stud bluff is he talking about?" Well the fact is, that dude is me, and I'm giving away some good stuff and I know I don't have no "pictures" to pr0ve it and no "t@l3nt" to make you beleive, just the word of LORD DOOM. Your Mission, Build your own adventure, 4 pictures, 4 captions No size or nuttin' limits just give me 4 pictures 4 captions anything you freaking want, (castle OR classic-castle OR fantasy related is mandatory) But honestly I don't care if it's not strictly that castley, freedom is key. I want to see some people really getting into their Lego's and building not for me, but for themselves. That's what gonna win this contest. Post entries (or links to entries) in this thread. 1 Winner, Twice a year. 7 SWEET FIGS. Challenge Ends June 1st 2008. Winner will be selected by a panel of 1 judge. Me. I won't be playing favorites here. Anybody can enter! Only one can win! Runner up will get a custom fig by DOOM too! Last edited by LORD DOOM on Tue Jun 17, 2008 3:08 am, edited 12 times in total. I just have a couple questions: When you say four pictures four captions, do you want a progressive storyline? And if so, can we use multiple locations? Voran_the_Scholar wrote: I just have a couple questions: When you say four pictures four captions, do you want a progressive storyline? And if so, can we use multiple locations? Only if YOU want to create a progressive storyline. The only thing I want is to see you build without reservations and inhibitions. Build like mad. It's what the "Maniac" would've wanted. May god rest his manic-depressive soul. I've been thinking about starting a comic series. This would be the perfect way to start out, though my idea involved at least one crown knight. I'm all sorts of game! Plus I have 0 Crown Knights so that's all cool. I would love to, but as I have recently exited my Dark Age I have a great Variety of Crownies and it's not fair to newer collectors that I can't use my Crownie Collection. JoshWedin wrote: 3. Refrain from criticizing the rules, guidelines, categories, or prizes. If you don’t like how the contest is run, feel free to run your own. But do not put down those who are doing so already. There is no need to complain about the categories, as no one is forcing you to enter. Even if you don't like them, look at them as a challenge. You will be surprised at the creativity inspired by a restrictive category. 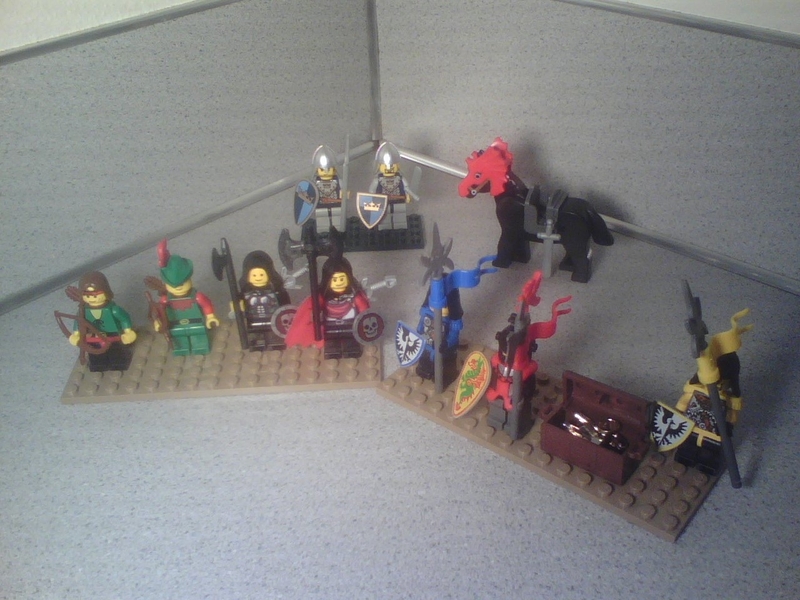 As for prizes, remember that donors are giving away Lego they could have kept. Hearing people ridicule the prizes they donated may make them reconsider doing so in the future. Hmm, I've thought much about a comic type thing, but never actually did it. Are Crown knight parts allowed, like a silver helm on a fig with a Lion Knight torso? I'm not criticizing the rules guidelines categories or prizes. The objective is also not exclude people and make them feel inferiour, and seeing as how I have a large collection of Crownies but little else, I am excluded from this otherwise excellent contest. Okay...I think I understand. An example would be extremely helpful though. I miss the maniac...and I hated when they stopped using real LEGO to make the comics. Hey guys let me clear things up a bit. There's no need to feel inferior due to your part selection Lord Zode, and I certainly had no intention of that by organizing this contest. So to answer Dr. J's question and hopefully relieve some of Lord Zode's discouragement, Crownie pieces are completely legitimate when used in this contest. Constructed Crown Knights and images representing their Heraldry are not, so yeah crown shields are out, Torso's could slip by if used on another type of fig. I'd love to see you compete too Lord Zode, don't feel limited by what you have, the only limitation is your imagination, just re-work some of your guys, surely if you have Crownies you must have a couple of Skellies too right? Why not mix-and match some of those elements to create a new mini-faction? To answer Black Ranger's question, a caption to an image is a short description that appears below the image. Most captions are a few words mentioning something important about the image that is not obvious simply by looking at the image, such as its relevance to the text. For complex images or images whose relationship to the text is unclear, the caption can be one or two short sentences, rarely three. Your "Captions" can be added directly to the picture itself using photo-editing software or typed beneath the images in your entry or listed separately, if you should so desire. And while I'm on that note anyway, yes Photoshopped entries ARE allowed, LDraw entries are not. Thanks, LORD DOOM! Good show! This is a good idea Lord Doom. I WILL (and when I say I will, I'm not lying) participate in this contest.